Threadripper 2 unboxing and install with Jim Anderson of AMD! For Intel, the temporary inability to keep pace with Moore’s Law—the foundation of its business—was a bit of an embarrassment, but the company is trying hard to catch up. Moore’s Law is an observation that has led to faster, cheaper and smaller computers, and a concept that Intel has followed for decades. It states that the density of transistors doubles every two years, while cost per transistor declines. Until recently, the company released chips every two years like clockwork. But making smaller chips is becoming challenging and more expensive, said Bill Holt, executive vice president and general manager for Intel’s Technology and Manufacturing Group, during the company’s annual investor day last week. Holt acknowledged that the company could not keep up with Moore’s law, at least temporarily. Chip advancements and cost savings slowed down with the current 14-nanometer process, which is used to make its latest PC, server and mobile chips. That was just a blip, though, and Intel will be back on track with Moore’s Law in relation to the economics and advancements in chip making, Holt said. “While it’s been harder than we thought and longer than we liked, we do not see in the long term that there will be a difference between what we were able to achieve in the past and what we expect to achieve going forward,” Holt said. Intel first encountered problems advancing chip technology with a troubled transition to its 14-nm process. Manufacturing issues led to product delays, and Intel slowed chip advancement to a 2.5-year time frame. As a result, Intel had to break away from its traditional “tick tock” model, which calls for two generations of chip technologies per manufacturing process. The company is now releasing three microarchitectures with the 14-nanometer process—it surprised observers with the introduction earlier this year of the “Kaby Lake” chip, which will follow Broadwell and Skylake on the 14-nm process. Intel, however, hopes to achieve better scaling and cost savings with the upcoming 10-nanometer and 7-nm processes, Holt said. 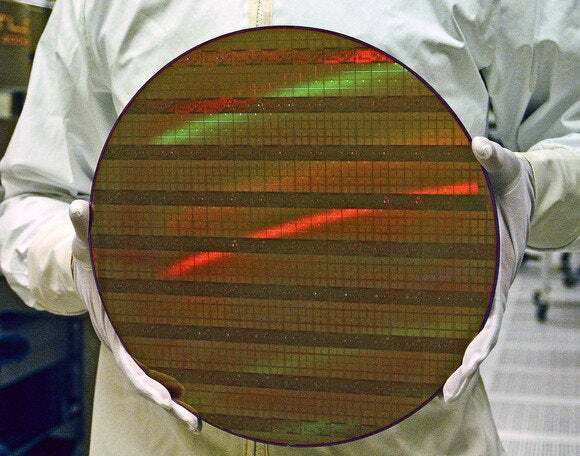 The first 10-nm chips, code-named Cannonlake, will ship in 2017. Experts have sounded alarm bells regarding the possible collapse of Moore’s Law, and even Gordon Moore, who made the original observation in 1965, said keeping up was becoming more difficult. Continuing Moore’s Law is becoming an expensive proposition, Holt acknolwedged. In 2011, Intel determined it would have to spend $104 billion over a 10-year period on manufacturing and development of technology and products, and in 2015, that estimate went up to $270 billion. The cost of development has gone up with an increase in expenses related to tools, wafers and manpower. “There is an increase in cost of research and development, but it’s not going to be the thing that stops us from pursuing Moore’s Law,” Holt said. Intel already has the most advanced manufacturing capabilities. Holt believes the company’s manufacturing will remain a big advantage over rivals, making the money spent on it worthwhile. In addition, the research pipeline is full of technologies that could advance computing and chip making. Intel’s future mobile chips may have some components based on gallium nitride (GaN), which is considered a faster and more power-efficient alternative to silicon. Gallium nitride belongs to a family of exotic III-V materials, based on elements from the third and fifth columns of the periodic table. Nanowires and new forms of memory like RRAM (resistive random access memory) and spintronics are also being researched, and could help scale down chips. Researchers are also looking beyond today’s PCs and servers to quantum computers, which function differently than today’s computers and could bring profound changes to chip manufacturing. Some technologies are researched for decades and may not come to fruition, but nevertheless add to the knowledge necessary to advance computing, Holt noted. “The future is quite robust,” Holt said.